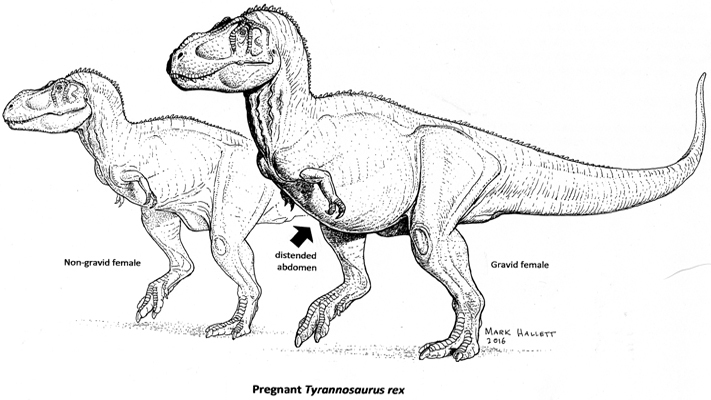 A pregnant Tyrannosaurus rex that roamed Montana 68 million years ago may be the key to discerning gender differences between theropod, or meat-eating dinosaur, species. Researchers from North Carolina State University and the North Carolina Museum of Natural Sciences have confirmed the presence of medullary bone – a gender-specific reproductive tissue – in a fossilized T. rex femur. Beyond giving paleontologists a definitively female fossil to study, their findings could shed light on the evolution of egg laying in modern birds. The femur of MOR 1125 was already broken when Schweitzer got it, and she acknowledges that most paleontologists wouldn’t want to cut open or demineralize their fossils in order to search for rare medullary bone. However, co-author Lindsay Zanno, an N.C. Museum of Natural Sciences paleontologist with a joint appointment at NC State, showed that CT scans of fossils may help narrow down the search. Authors: Mary Schweitzer, Lindsay Zanno, NC State University and the NC Museum of Natural Sciences; Wenxia Zheng, NC State University; Sarah Werning, Des Moines University; Toshie Sugiyama, Niigata University, Niigata, Japan. Medullary bone (MB), an estrogen-dependent reproductive tissue present in extant gravid birds is texturally, histologically and chemically distinct from other bone types. Phylogenetic proximity led to the proposal that MB would be present in non-avian dinosaurs, and recent studies have used microscopic, morphological, and regional homologies to identify this reproductive tissue in both theropod and ornithischian dinosaurs. Here, we capitalize on the unique chemical and histological fingerprint of MB in birds to characterize, at the molecular level, MB in the non-avian theropod Tyrannosaurus rex (MOR 1125), and show that the retention of original molecular components in fossils allows deeper physiological and evolutionary questions to be addressed.